Zachariah Bass is a young Texas Ranger, struggling to define his role in serving the people of the state’s remote western territories. 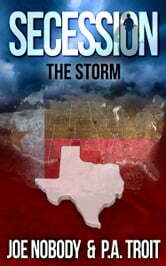 Working a series of heinous crimes, Zach uncovers a dark, treacherous secret – a conspiracy that could alter America’s future and result in the secession of Texas. Co-authored by P.A. Troit and bestselling writer Joe Nobody, Secession explores a world where a hopelessly gridlocked government fuels an ever-deepening divide between right and left. The public’s frustration with the country’s direction forces desperate leaders on both sides of the political spectrum to consider splitting the union. Based on actual historic events, current economic realities, and a growing global trend, Secession immerses the reader in a lifelike scenario that could be America’s future.